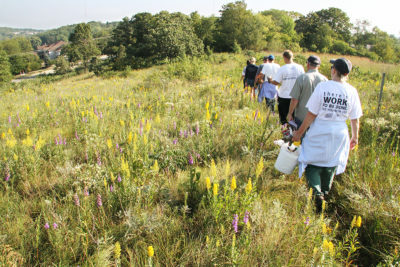 With a 1,200-acre Madison property, 500 acres of outlying properties across the state, and a field and gardening staff of fewer than 10 people, volunteers play an essential part in restoring, tending, and improving the natural areas, gardens, and trails. We are fortunate to have strong connections with dozens of organizations from the UW campus and greater Madison area who make an annual commitment to participate in group service projects. The efforts of these regulars are bolstered each season by new volunteer groups. Every year, Arboretum employees and volunteer restoration team leaders work with 50–60 groups, comprising 400–600 volunteers. Collectively, they contribute about 1,300 hours of service annually. Who are these volunteers, and what do they accomplish? We have long -running relationships with Alpha Kappa Psi, the co-ed professional business fraternity at UW–Madison, and the United Way of Dane County, which organizes the three-day community-wide Days of Caring event every August. For more than 15 years, student members of Alpha Kappa Psi, the world’s oldest and largest business fraternity, have taken on a group service project. If we mapped the sites where Alpha Kappa Psi members have worked, nearly the entire Arboretum would be included. Over the years, members have repaired trails, spread mulch, pulled garlic mustard and dame’s rocket, cut down bittersweet, picked up garbage, and tugged out honeysuckle. Days of Caring is the kickoff event for United Way of Dane County’s annual campaign. This event mobilizes several thousand employees from regional companies to volunteer at local nonprofits, conservation organizations, and community sites. Nearly 100 volunteers from a dozen different organizations come out on three separate mornings to tackle gardening, restoration, and trail projects. Days of Caring volunteers have spread mulch around trees and shrubs in Longenecker Horticultural Gardens, repaired trails in Gallistel and Wingra woods, cut sumac from steep slopes at Pasque Flower Hill (a nearby outlying property), pulled weeds from the Viburnum Gardens, hauled woody debris from Teal Pond Wetlands, and much more. We look forward to working with volunteers this August in Wingra Woods, Longenecker Horticultural Gardens, and Curtis Prairie. Keep your fingers crossed for favorable weather! While we appreciate and depend on these long-term connections, we are also eager to work with new volunteer groups each season. We have welcomed college students who come to Madison to do spring break service projects, youth groups from local community centers seeking a meaningful summer vacation activity, faith groups acting on their beliefs in stewardship and giving, scout troops earning a badge for conservation work, and family reunions seeking to give back to a place they have enjoyed together over the years (and even generations). These fresh volunteers energize work that remains constant, and they gain a deeper understanding of what it takes to steward the Arboretum. The success of our service group collaborations also depends on our dedicated employees and volunteer team leaders, who provide a warm welcome, effective supervision, interesting stories, and juice and cookies. If you are part of a group—scout, faith, school, corporate, neighborhood, alumni, or friends—looking for a way to spend time together and invest in the Arboretum and all it offers to the community, contact me to learn more about group service project opportunities this summer and fall.